Interning on the Bays: How My Experience with the Center Sparked a Passion! In 2016, during my senior year at Sussex Technical High School, the Delaware Center for the Inland Bays allowed me to volunteer as an intern. This has created an array of wonderful opportunities and career-benefiting learning experiences as well as the development of some amazing friendships. The Center heavily relies on partnerships and volunteers to complete their mission. This wide range of volunteers and partnerships has led to many opportunities for networking and creating friendships that I appreciate immensely. Over the past few years, I’ve met and developed meaningful relationships with other employees and interns at the Center, and have also worked with volunteers from many different projects such as installing floating wetlands and the annual inland bays cleanup. I even have met new friends, and spent time with old ones, at a couple conferences! During summer 2018, I used the Center’s boats for projects like land surveying in Pepper Creek! I am fortunate enough to have attended the 2018 Delaware State University Annual Summer Research Symposium and the 2019 Partnership for the Delaware Estuary Science and Environmental Summit. These opportunities broadened my knowledge and awareness of ongoing projects and issues both inside and outside of the Inland Bays watershed. It was amazing to learn about other adaptations of projects the Center does, such as living shoreline restorations, recycled oyster shell bagging, tidal marsh studies, and even the implementation and research of biochar (check out my blog post about biochar here: The Secrets of Biochar). I was also granted the opportunity to attend a Science and Technical Advisory Committee (STAC) meeting and a Center Mountaire Committee Meeting this past summer. At the latter meeting the 2018 Consent Decree between DNREC and Mountaire and the 2017 DNREC Notice of Violation to Mountaire were reviewed which was insightful and fascinating to be a part of! Interning with the Center has permitted me to work on a handful of different projects- all benefitting the bays. Over the summer another intern working at the center, Emma O’donnell, and I learned to use the Center’s equipment. We used the tractor and Gator at the James Farm for different projects like spreading mulch/wood clippings along the trails. 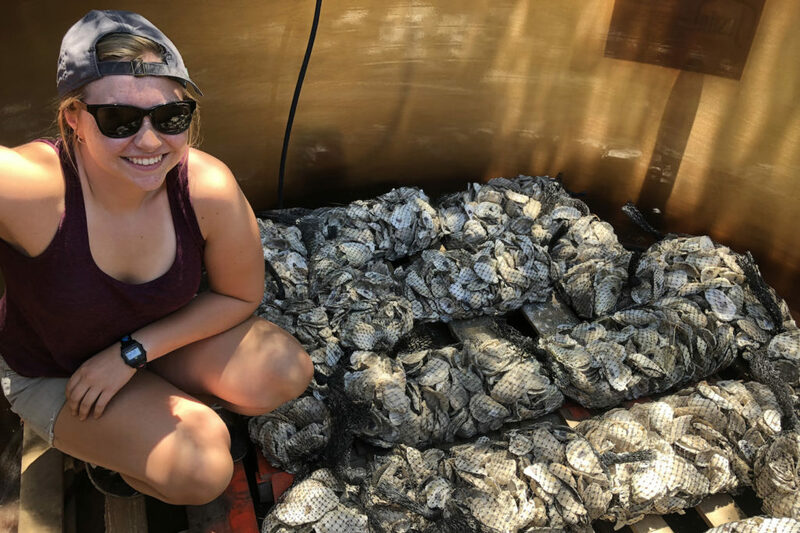 We got to use the truck for a ton of awesome (and sometimes stinky) projects like collecting oyster shucks from restaurants, eel-way maintenance, fish and tree surveys, and seaweed monitoring. Emma and I also used the Center’s boats for projects like land surveying in Pepper Creek, spat rack deployment and collection, and seaweed monitoring. Prepping and deploying bags of recycled shell was a not-so-glamorous part of the job! Later in the summer, I got to travel with the Center to a DNREC lab in Dover to put together sondes, which we later deployed in the Indian River. These Sondes were used to collect data for the Mountaire Pollution Report. I also got to complete data analysis and create graphics displaying the groundwater nitrate concentrations of some of Mountaire’s disposal farms. It was a great learning opportunity and a good real-world application of what I’m currently studying in college. the knowledge and opportunities needed to help in managing such important issues. 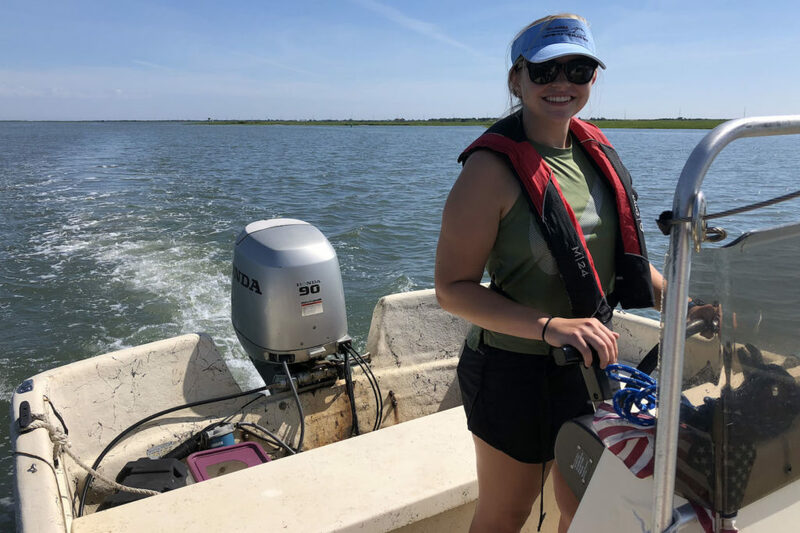 Overall, interning with the Delaware Center for the Inland Bays has sparked a passion in me for the watershed that I hike, hunt, fish, swim, and just live my everyday life in. I learned about its many ongoing issues and was granted the chance to be a part of the mission through science, restoration, outreach, and education. My passion for volunteering has also been heightened through my time working with the Center and I will continue to dedicate my time to the bays- whether it be reforestation projects (my personal favorite) or trash clean ups. It’s important to serve our communities, which includes not only taking care of the people living there but also the physical environment. Without what I’ve learned from working at the Center, I wouldn’t be able to fully understand why it is imperative that we work so diligently in restoring, protecting, and educating people about our Inland Bays watershed here in Sussex County. 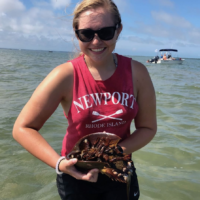 Bryanna Lisiewski attends the University of Delaware with a double major in Natural Resource Management and Agriculture and Natural Resources. She also has a minor in Statistical Data Analytics and is a part of the Community Engagement Scholars Program. She grew up around the Inland Bays and loves spending any time out on the water. Her favorite activities around the bays include stand up paddle boarding and hunting. This entry was posted in Staff Blog and tagged biology, boating, intern, shucks, summer. Bookmark the permalink.